This is a 6 x 7 metal shed with a stylish, practical apex roof. Hot dipped galvanised steel has been used throughout and this adds an incredibly tough level of protection and durability. The shed has sliding doors which bring you quick and easy access to the spacious interior. With a guarantee against rust, this is a building that provides tremendous value for money. 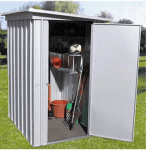 This is a reasonably sized metal storage shed that will fit in most gardens. Like others in the range it uses an apex roof to successfully protect the building against rust. As the water just runs directly off the building thanks to the upside down V-shape, it doesn’t get the chance to gather in a gutter or on top of the shed. The other reason manufacturers like to use this particular style is because it also provides more height within the interior of the shed. You can store tall, awkward items with no problem thanks to this additional height. With a width of 2.02m and a depth of 2.17m, you have plenty of internal storage without the shed taking up too much exterior space. The roof has a height of 1.88m and 1.63m for the eaves. The sliding doors when closed measure 0.80m wide and 1.57m high. Walton’s has made sure this shed provides an outstanding durable structure thanks to the solid metal cladding. With horizontal clad details, the building is not only tough, but it also looks great too. The shed is built with hot dipped galvanised steel, offering not only a strong exterior, but also an exceptionally strong frame too. There is absolutely no risk of this building weakening over time. Metal is a lot sturdier and weatherproof than wood, providing you with great value for money. We weren’t surprised by the floorless design. After all, this shed has been designed specifically for heavyweight storage. This includes lawnmowers, BBQs and particularly heavyweight machinery. If there was a floor included it would have to be exceptionally strong and would really bump up the cost. What this does mean though is that you need to build it on a very solid surface. Concrete is the best choice, but you can also choose to build it on paving stones if you don’t have any concrete areas in the garden. An excellent benefit of this metal shed is that it doesn’t and will never require treatment. It’s a low maintenance building that is ready to be used as soon as it has been assembled. This is another advantage over similar sized wooden sheds which tend to need treating on an annual basis. 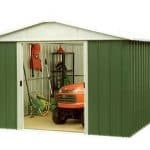 It provides great cost savings as well as eliminating time and effort spent on the shed. To give you maximum peace of mind, the company also gives you a 10 year anti-rust warranty. We recommend you familiarise yourself with the terms and conditions of this warranty just so you know exactly what it protects the building from and more importantly, what it doesn’t. Two solid, heavy duty sliding doors are supplied with the shed. This is a great design feature which again highlights the shed’s heavy-duty storage potential. The last thing you want to worry about when lifting heavy items in and out of the shed is how you will stop the doors closing on you. The sliding feature ensures they stay open when you need them to. 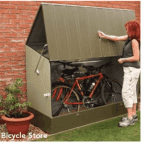 They are totally lockable so you can keep the shed secure and safe from thieves. Another thief deterrent feature is the fact that the shed comes with zero windows. No matter how hard they try, nobody will be able to peer inside at the contents. This shed guarantees a secure and private place to store anything you want to. Lockable doors and an outstandingly tough exterior make it impossible to get inside the shed without a key. As it is windowless, you are also guaranteed maximum privacy. This is great if you are planning on working in the shed or if you need to store anything valuable. Don’t be deterred by the lack of extras and customisation options available for this model. 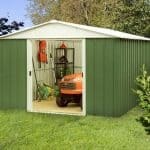 It simply highlights that you are getting a high quality garden shed that doesn’t need any extra improvements. It has an attractive style, is one of the most durable buildings available and requires no regular maintenance. It is also really secure so you don’t need to worry about updating its security. 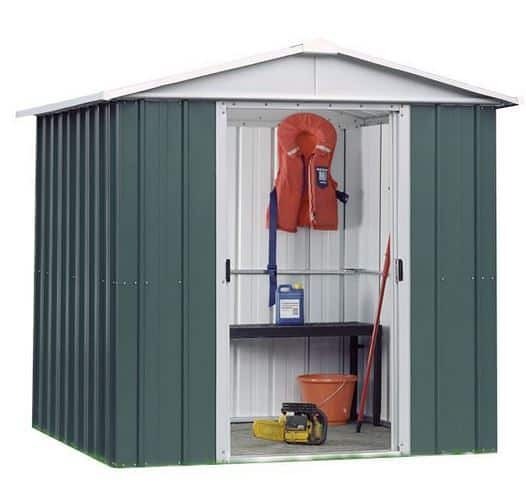 The only helpful thing Walton’s do offer for their Yardmaster sheds is an anchor kit. However, you don’t need to buy this as it is provided with the shed as a free gift. So what does it do? Well it basically ‘anchors’ the sheds frame to the base. Whether you are installing the shed on top of concrete or paving stones, it can be secured down with screws contained in the anchor kit. They aren’t complicated to use either. The shed already comes with pre drilled holes situated in the base rails. The screws literally just slot right in, providing a strong hold and giving the building a much more secure structure. Despite such a low cost, it’s great to see Walton’s haven’t compromised on the quality of the building. Every part of the shed has been designed to an exceptionally high quality ensuring it stands up to the harsh elements. Galvanised steel has been used to give the shed an excellent barrier against daily wear and tear. Coated in zinc, it is also really resistant against water, giving it a fantastic overall durable design. 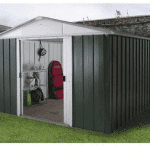 This is one of the smaller sheds on offer in the Yardmaster range, yet it still manages to give you a good level of storage space. It is capable of storing heavy gardening tools and equipment. The sliding door feature also ensures you have maximum interior storage without taking up much exterior space. Out of the rest of the sheds in this range, this one is really easy to put together. Its smaller size means it shouldn’t take too long to assemble provided you have two people installing it. The panels are easy and safe to fix together thanks to the hemmed edges. 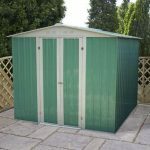 We recommend this shed for those on a budget who are looking for a high quality, long lasting building. It costs half the price of a wooden shed yet still provides a stylish storage space. With no annual treatments to worry about, this adds to the sheds value. Final Thoughts: This is a small size shed with a large number of benefits. It has been exceptionally designed with affordability, quality and durability in mind. The small features such as hemmed edges and flame retardant safety panels make it one of the safest sheds available on the market. It is especially suitable for heavyweight storage and is quick and easy to assemble.